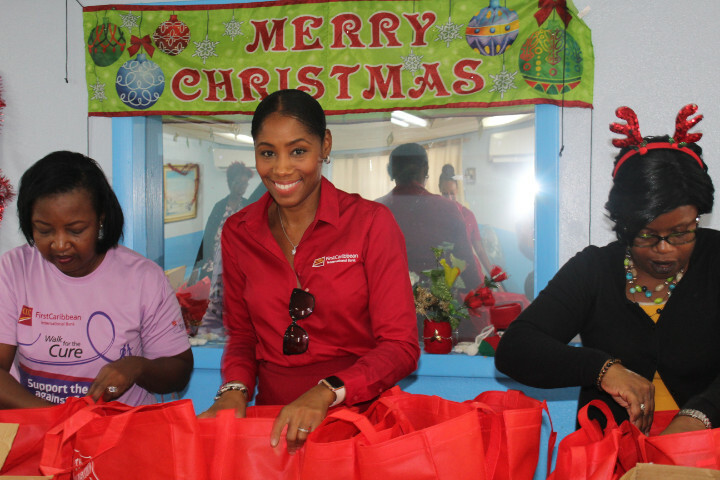 CIBC FirstCaribbean’s Mychelyn Watson smiled cheerfully as she and other bank volunteers prepared food parcels prior to the Salvation Army’s Annual Christmas Luncheon. 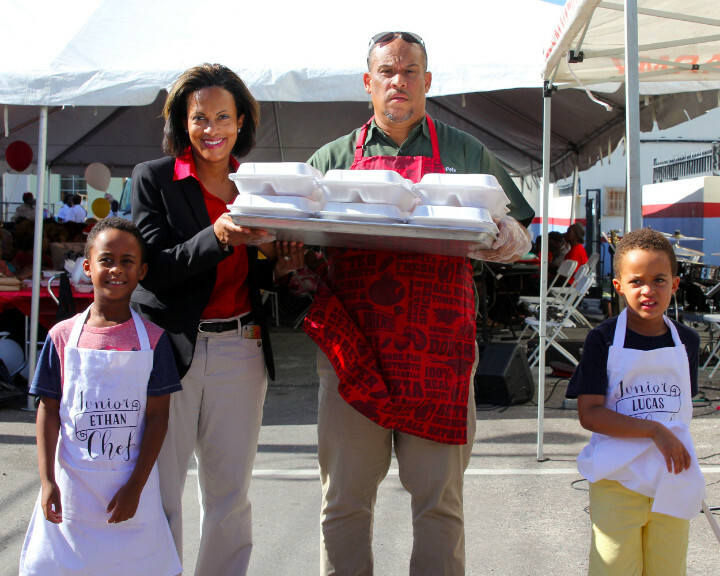 Nassau, Bahamas – Hundreds of people gathered underneath cool tents outside the Salvation Army’s Headquarters on Mackey Street on Thursday to share in an afternoon of fellowship, holiday festivities, and a hearty Christmas meal. The Salvation’s Army’s Annual Christmas Luncheon on December 20 catered to approximately 600 people, mainly senior citizens, as part of the organization’s Christmas Cheer Program, an extension of their year-round Feeding Program. CIBC FirstCaribbean bank staff, led by Managing Director Marie Rodland-Allen, helped serve the lunch and also to pack some of the 750 Salvation Army food bags for attendees to take home and for delivery to other charitable organizations and those unable to attend. During the event the bank also made a cheque presentation to the Salvation Army. “CIBC FirstCaribbean International Bank is honoured to have been able to volunteer in the Salvation Army’s Christmas grocery packing initiative and Christmas luncheon. The Salvation Army of The Bahamas does a wonderful job caring for the disadvantaged in our communities throughout the entire year and we are pleased to partner with them to help make a difference in the lives of many,” Mrs. Rodland-Allen said. 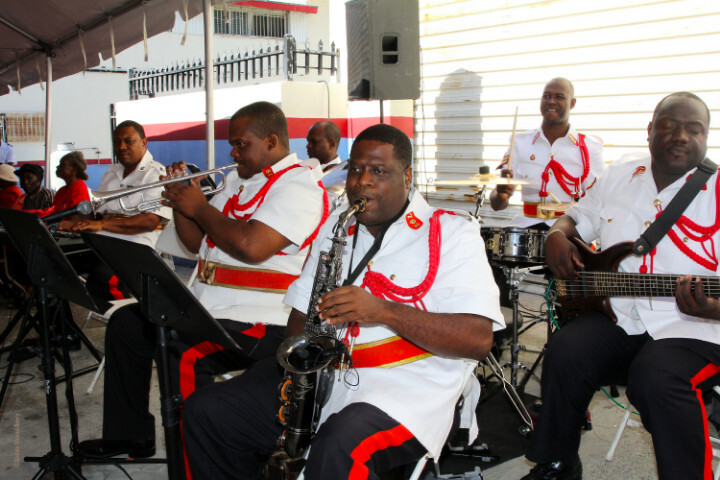 Attendees of the Salvation Army’s Annual Christmas Luncheon were treated to live music and holiday favorites from the Royal Bahamas Police Force Band. The Royal Bahamas Police Force Band played traditional season favourites and gave a rendition of “The Christmas Story.” Caribbean Bottling provided water and sodas. 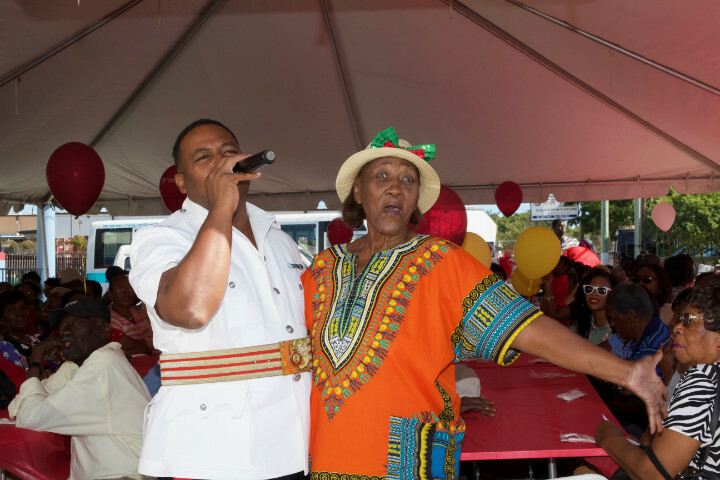 Minister of Social Services the Honourable Frankie Campbell, who was in attendance, said he was happy to see CIBC FirstCaribbean participating in community relief efforts, and that there was a sense of gratitude from the senior citizens. An attendee gets into the Christmas spirit during the Salvation Army’s Annual Christmas Luncheon. 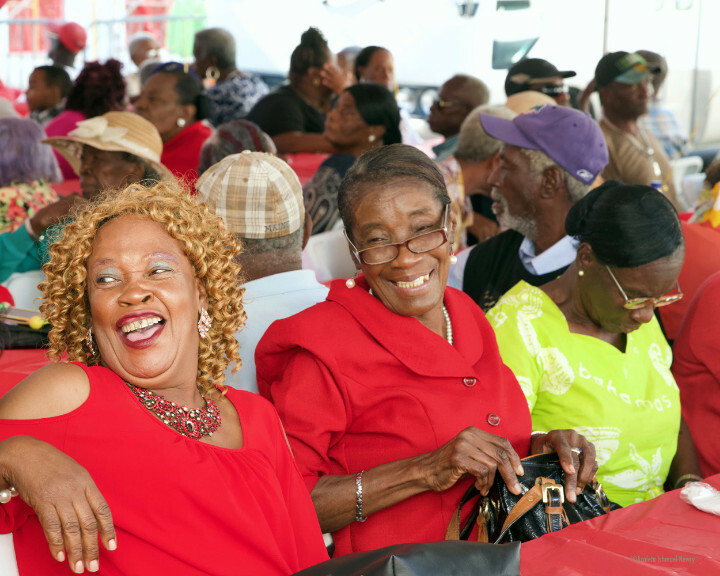 Partygoers enjoying the community festivities as they wait to be served a hot Christmas meal by the Salvation Army and CIBC FirstCaribbean volunteers. 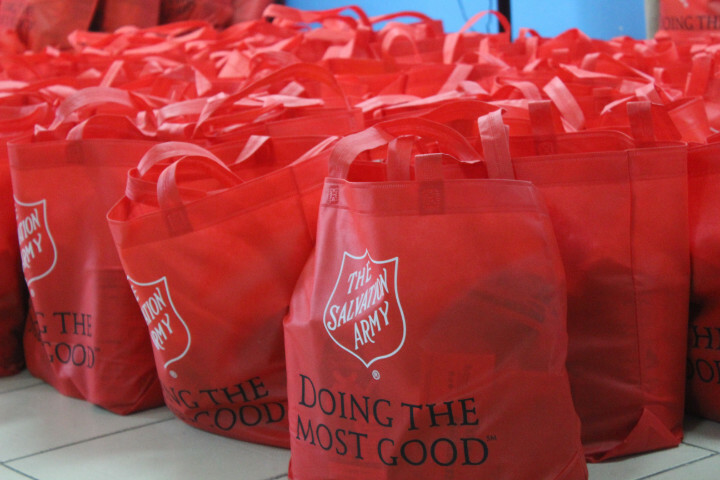 The Salvation Army, with help from CIBC FirstCaribbean, packed 750 food parcels for distribution to attendees at the Salvation Army’s Annual Christmas Luncheon as well to other organizations for those in need. 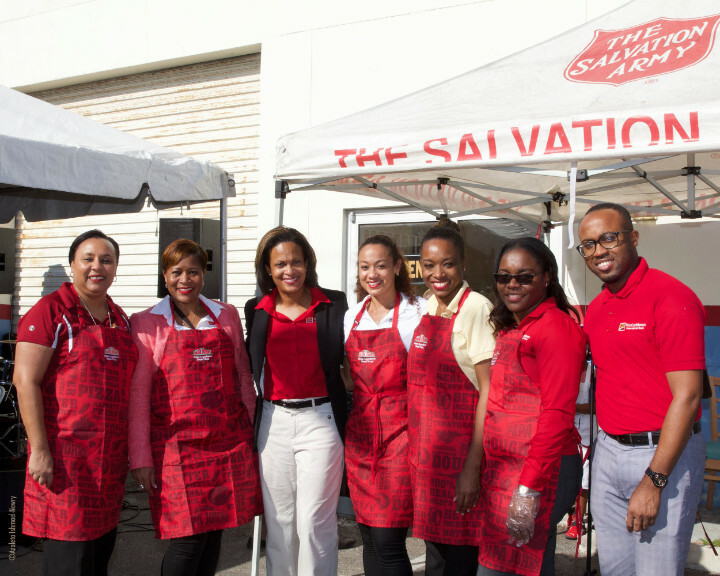 CIBC FirstCaribbean volunteers rolled up their sleeves and donned aprons to help the Salvation Army cater to approximately 600 people at their annual Christmas Luncheon. L to R: Antionette Fox, Antoinette Turnquest, Marie Rodland-Allen, Nikia Christie, Ria Newbold, Alicia Stuart, and Daron Lightbourne. 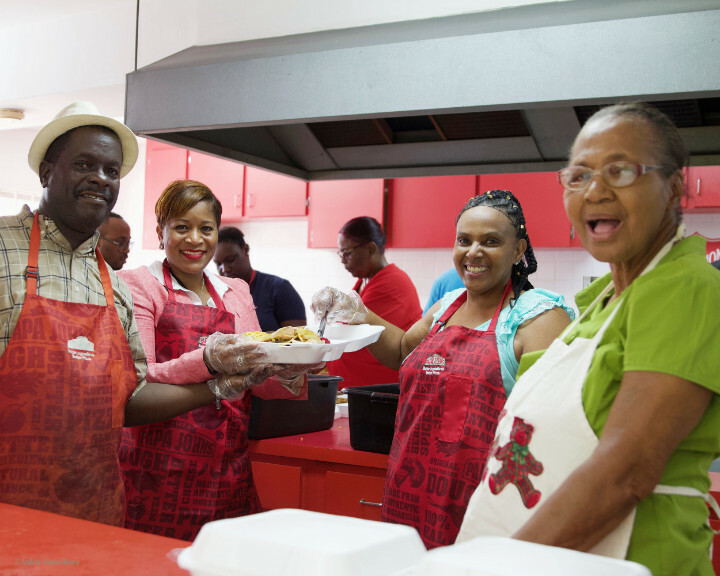 Salvation Army workers and CIBC FirstCaribbean volunteers in the kitchen preparing delicious, warm Christmas meals for hundreds of attendees at the Salvation Army’s Annual Christmas Luncheon. CIBC FirstCaribbean Managing Director Marie Rodland-Allen, Dr. Allen, and youthful helpers Ethan and Lucas helping to distribute food for partygoers.